Hosting a “boys’ weekend” at Saule, our rental home in Little Compton, Rhode Island (Go to http://www.sauleri.com. We’re listing #4711871 Homeaway.com), I made this as a side dish to the piles of meats we devoured. 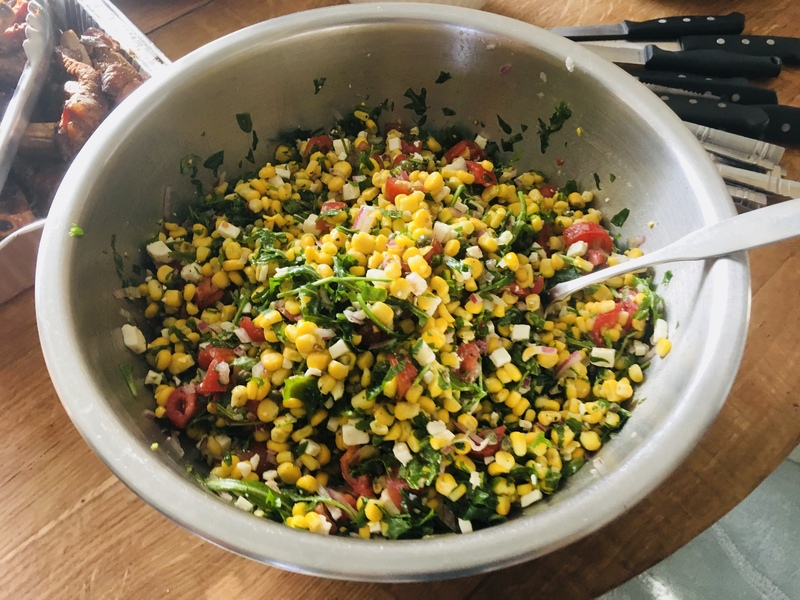 This is a salad you want to make now, while corn and tomatoes are still in season, but I’ve found that frozen organic corn and greenhouse tomatoes work pretty darn well. If you’re using fresh corn, remove it from the ears, then pan saute it in a little olive oil, but leave it nice and crisp. If you can roast the ears of corn over some coals, even better. If you’re using frozen corn, pan saute in a little olive oil. Set the corn aside to cool. Mix the corn with all the other ingredients in a bowl. Cover and refrigerate. Right before serving, taste and season it again, mixing well. I think it’s best a little cooler than room temperature.